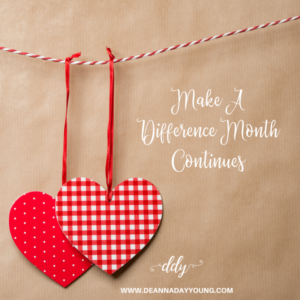 February Make a Difference Month Summary And Additional Ideas! *Day 5 – Buy a gift card for someone and give it away. *Day 6 – Give a special treat to your mail carrier. Sunday was National Mail Carrier Day. *Day 7 – Feb 7th is national send a card to a friend day. Choose a special card and a special friend. *Day 8 – Buy a dozen donuts and drop off to your favorite business. OR…. It is also National Pizza Day. What about ordering and paying for a pizza to be delivered to a someone who needs a night off from cooking? *Day 9 – Take some homemade muffins to your neighbor. *Day 10 – Put $1.07 in a baggie with a note that says “buy yourself something on me today” and leave it in the toy section at the Dollar Tree. OR…it is also National Umbrella Day. You could purchase an umbrella to give away to a stranger. *Day 11 – Give a hug to someone who looks like they need it! OR… it is National Visit A Shut-In Day. Maybe you could visit someone in the nursing home who could use that hug. Next week is Random Acts of Kindness Week. Visit the blog again on Sunday to get geared up for some extra cool ideas to spread kindness all week long. Make a difference to someone everyday. It really can become a way of life as we change the world one act of kindness at a time. This entry was posted on February 9, 2018 with tags: #kindnessmatters, #makeadifference, #makeadifferencetosomeoneeveryday, #randomactsofkindness by Deanna Young. I’ve really enjoyed these posts!! I’m going ton to work on spreading some kindness daily! God bless you! Thanks, Laurie! That is exactly what I hope will happen! You’re awesome! See you this spring! Can’t wait to meet you in person!